The Digimon Reference Book profile for December 5th, 2015, is Hookmon. A translation is provided below; you may use it freely on forums, wikis, etc. so long as you link back to or cite this page. Profile: One-eyed pirate Digimon. On an adventure to chase a phantom white Whamon through the "Net Ocean," it's a courageous man of the sea that stands up to the raging ocean. Its right hand has become a hooklike claw, and once it's hooked its spoils with it, it stubbornly never parts with them. 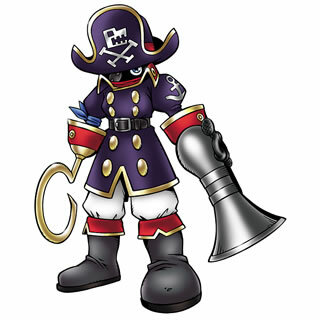 Its special move is to fire the cannon on its left hand, "Captain Cannon." (TL note; "spoils" here is 獲物 emono which can refer to both "trophy/spoils" and "prey." The Digimon Reference Book is Bandai's official bible on the various Digimon species, first launched in 2007 and now comprising over seven hundred different Digimon out of the thousand-plus species that exist. It updates weekly with new Digimon profiles. Last week's profile was Valvemon.